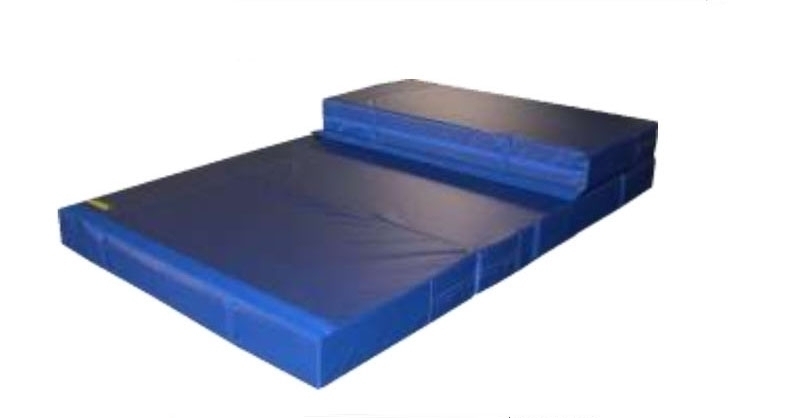 Competition mats are recommended for use around and under apparatus for all levels of training and competition. Each mat is covered with 18oz coated vinyl and filled with high density polyurethane and crosslink polyethylene foams. All mats meet FIG, NCAA & NFSHSA requirements. Folding models are bi-fold and are available in 4 " (12cm) or 8" (20cm) thickness and various sizes. Mats come with 4" hook and loop fasteners to enable the mats to be joined together. Reinforced handles make these mats easy to move. 12cm Mats meets the ASTM F 1292 recommended performance requirements with a drop height of up to 13 feet. 20cm Mats meets the ASTM F 1292 recommended performance requirements with a drop height of up to 14 feet.